"By 1970 there seemed little new for Benny Goodman to say musically. A major success 35 years earlier and the possessor of a briliant but unchanging clarinet style, BG was performing less during this period and his big-band projects generally emphasized re-creations of the past. 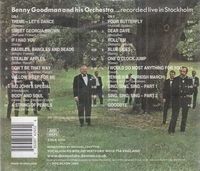 This attractive double LP [above, offered in CD format](which does not list the personnel) features Goodman in a big band mostly comprised of Europeans (other than guitarist Bucky Pizzarelli) running through a program not all that different than what he might have presented in 1940; only four of the 20 songs are of newer vintage."